I thought I'd quickly share a recent image that I'm very happy with. In my continuing experimentation with light painting, I brought a perfect dandelion seed head into the house yesterday evening to play around with some flashlight macro photography after dark (and after my girls went to bed). It was really fun to play around with light, depth-of-field, and focal plane under controlled conditions (not the norm when I'm photographing nature outside). In fact, it was a great learning experience and I highly recommend it for any budding or even practiced macro nature photographers. Over the next week or so, I'll share more of the staggeringly different results I got with just a small change of light angle, focus, and/or aperture. For this particular image, I lit the seed head almost directly from the side with a single LED bore light (for cleaning gun barrels). I used my McClamp (attached to a dining room chair) to hold the flashlight to provide consistent, repeatable light and so I could work hands-free. I was shooting using my Canon 7D, an EF 180mm f/3.5L macro lens, and obviously a tripod. I wanted to focus on the outer ring of fluff and let the rest be out of focus. Live View and the depth of field preview button let me get some sense of what it was going to look like and I settled on an aperture of f/5.6. Close to wide open, sufficiently blurring the out-of-focus portions, but with just enough DOF to ensure some parachutes (known as a pappus) were mostly sharp. That gave me an exposure of 2.5 seconds at ISO 100. I should also mention that this image is a stitched composite of 10 higher magnification (close to life size) images with about 30-50% overlap (5 across the top half of the seed head, and 5 across the bottom). So, I had to wait for post to see the whole effect. Other than some small Levels adjustments in Photoshop, I did very little post-processing on this image beyond the stitching. It just didn't need much. 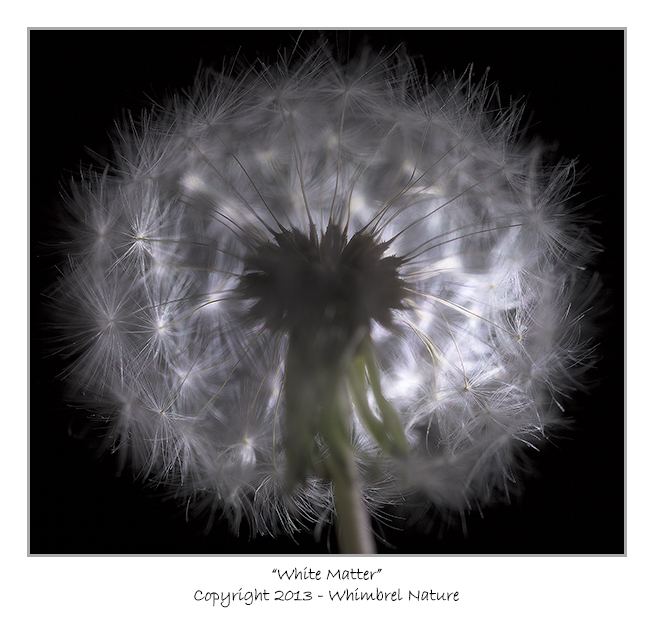 I named this image "White Matter" because the seed structures reminded me of nerve cells, with the many short dendrites and long axons all interconnected. Plus, the lighting helps me imagine various nerve cells "lighting up" with a nerve impulse. There is something mechanistic and regimented about the structure, but the lighting and the soft-focus effect of the out-of-focus parachutes give it a mystical and mysterious feeling. A plant "brain" dreaming if you will. Hope you enjoyed the post and the image. Please leave a comment, I'd love to hear from you. By the way, if you are interested in a print of this image, the resolution gained by stitching 10 images together means that this image can easily be blown up to a 4' by almost 5' panel (or more) with very high quality.